Using herbs and nutrition for heart health can be a gentle, and effective method of preventing problems later. But for those who already have a heart condition, herbs may help as an alternative, along with any therapy your doctor prescribes. The key is to choose wisely, and with purpose, because choosing the wrong herb may not have any contraindication for cold or viral infection, choosing the wrong herb for the cardiovascular system may leave a person without the protection that they counted on. Generally, reducing sodium with hypertension may help, though sodium is not to blame for high blood pressure. Is the aluminum salts, sugar and other agents in table salt, which are unnatural and can cause serious harm to the body. Foods naturally high in sodium (the good kind) are seaweed, including Kelp, Bladderwrack, and Dulse. They can be used dry or in tincture form for full health benefits. Good news though, herbalists agree that Motherwort, an herb included in the formula, is very helpful for soothing the nervous system, as well as the heart. Motherwort tinctures have been used to help regulate palpitations and high blood pressure, easing stress and nervousness. Beyond that, it is considered an excellent heart tonic, as it contains the alkaloid leonine, a mild vasodilator. This compound may help to relax smooth muscle and regulate heart rhythm. Motherwort is also a diuretic, and in traditional Chinese medicine, it has been shown to assist in strengthening the heart and promote longevity. Arteriosclerosis, angina, mild to moderate congestive heart failure, or the prevention of myocardial infarction, hypertension, mitral valve prolapse, for all of these conditions, Hawthorn is indicated. And, with Motherwort extract you may be able to take the edge off and infuse some light and joy into your life. All positive, as it has been shown to work well with digitaloid-containing and beta-blocking drugs to increase the efficiency of heart medications. One thing to note is that Hawthorn flower and leaf are more active than the Hawthorn berries, so they are best when taken together. Mild to moderate heart failure will usually respond positively to the herbs such as Hawthorn, since it is mild acting, but effective for strengthening the heart. It does not have the strong effect of digitalis drugs, nor the side effects, but it has been used in cases of heart failure and may actually help to prevent it. It doesn't appear to have any negative effects for arrhythmias and has been used along with magnesium and CoQ10 to normalize irregular heartbeat. For those who suffer from heart problems like palpitations, Tansy leaf may help with the irregularities in heartbeat, as well as the fluid retention often caused by congestive heart failure. Fenugreek has a strong modulating effect on the blood lipid levels and can substantially reduce the risk of atherosclerosis. In diabetes, you may suffer from lipid imbalance, and this herb may be just the thing you need to lower cholesterol and triglyceride levels. Another action of this herbal tincture is to reduce platelet aggregation which, in turn, may dramatically reduce the risk of abnormal blood clotting, often associated with stroke and heart attacks. Like most spices, Fenugreek seed contains many important antioxidants and has the added benefit of protecting other dietary and internally produced antioxidants from free radical damage. This is an important benefit for helping to fortify the body against a range of conditions. Garlic bulb is one of the most important herbs to add to your regimen for heart health. Studies on garlic show that contains high amounts of allicin, useful for lowering blood lipid levels, and beneficial for cardio function. In the words of the ancient Greek physician Hippocrates, "Let food be thy medicine, and medicine be thy food", as this wonder is very rich in vitamin C, B6, and manganese. It also contains good amounts of other nutrients essential for good health. High blood pressure, or hypertension, is one of the most important drivers of disease, and garlic can have a significant impact on your health. In one study, aged Garlic bulb tincture at doses of 600-1500 mg per day was just as effective as some of the prescribed drugs over a 24 week period. Supplementation doses must be fairly high to have these desired effects though, and there is approximately 26 mg. per drop of our single extract. This recommended amount is equivalent to about 4 cloves of garlic per day. So you can see why this extract may be a valuable aid to your health. Cayenne pepper has been prized for thousands of years for its healing powers. Folklore from around the world has recounted how amazing the results from this herb in simple healing as well as for baffling health problem. Recent studies show Cayenne pepper tinctures can be medically validated, and herbalists strongly agree, that the herb is not only good for the heart and circulatory system, but for the digestive system as well. It also acts as a catalyst for increasing the effectiveness of other herbs in the formula. By improving blood flow, Ginkgo biloba has led researchers to believe that this herb may be most beneficial for the cardiovascular system. 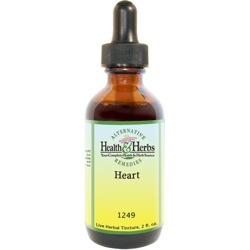 Studies have shown that the herbal tincture may help to improve heart blood flow to actually help to prevent heart disease. Additionally, early research shows that Ginkgo may be helpful right after a stroke. The herbal extract has been reported to strengthen capillaries, decrease clotting, so that blood can flow more freely, increase glucose uptake in the cells, help to prevent fat degradation, protect the mitochondria from free radical damage, and it helps to reduce inflammation. So, when you think about winning the battle against heart disease, and other disorders such as varicose veins, adding Ginkgo biloba tincture to the defense system may just give you the winning edge you need. Ingredients: Motherwort, Hawthorn Berry, Tansy Leaf, Fenugreek Seed, Garlic Bulb, Cayenne Pepper, Hawthorn Leaf, Ginkgo Biloba, Structured Water, 20% Alcohol. Non-Alcohol: Motherwort, Hawthorn Berry, Tansy Leaf, Fenugreek Seed, Garlic Bulb, Cayenne Pepper, Hawthorn Leaf, Ginkgo, Structured Water and Vegetable Glycerin. Instructions: Use 6-12 drops in juice, water, under the tongue or as desired. May be taken 3 times daily. Shake well. Store in a cool dark place. Keep out of reach of children. Contraindications: See individual herbs for contraindications and side-effects.